In every competitive exam, the General Awareness section plays a very important role. Mainly in this area, most of the candidates either score or lose the marks. Hence, to help all those individuals, we have provided GK Questions on each and every topic of the General Awareness on our website. 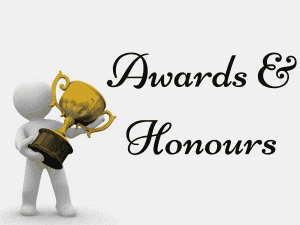 As a part of it, here we have updated a complete list of popular Awards and Honours in India. On this page, we have clearly provided the important Awards and Honours secured by all the legendaries in various streams. Therefore, the aspirants must read this article completely and must gain knowledge over the International and National Awards and Honours. Madan Mohan Malaviya 2015 Posthumous, Scholar and educational reformer and founder of Banaras Hindu University. Atal Bihari Vajpayee 2015 Ex-prime Minister and one of the best parliamentarian for over four decades. Vallabhbhai Patel 1991 Posthumous, independence activist, first Home Minister, Was responsible for the unification of all Indian princely states. Rajiv Gandhi 1991 Posthumous, Sixth Prime Minister. Therefore, the complete list of Important Awards and Honours in India have been provided here. So, the candidates can check the Awards and Hours and can test their knowledge. To improve your knowledge on other topics of General Awareness, visit our GK Page.